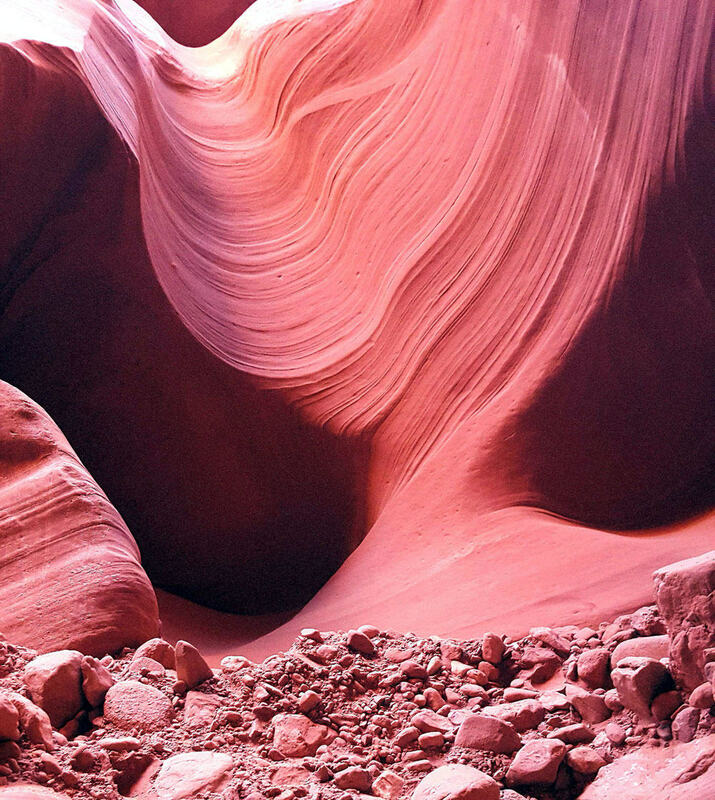 Visiting Antelope Canyon can be the highlight of your trip to Arizona. As you’re surrounded by the red canyon walls, carved by nature over millennia, it’s easy to see why the Navajo people hold this place sacred. Antelope Canyon is a slot canyon, created by water rushing through the sandstone during flash floods. The water carves a winding path through the stone, forming round and waving walls marked with delicate lines. We visited back in September 2016. It was one of the more expensive items on our itinerary and I had wondered if it would be worth it. It was. 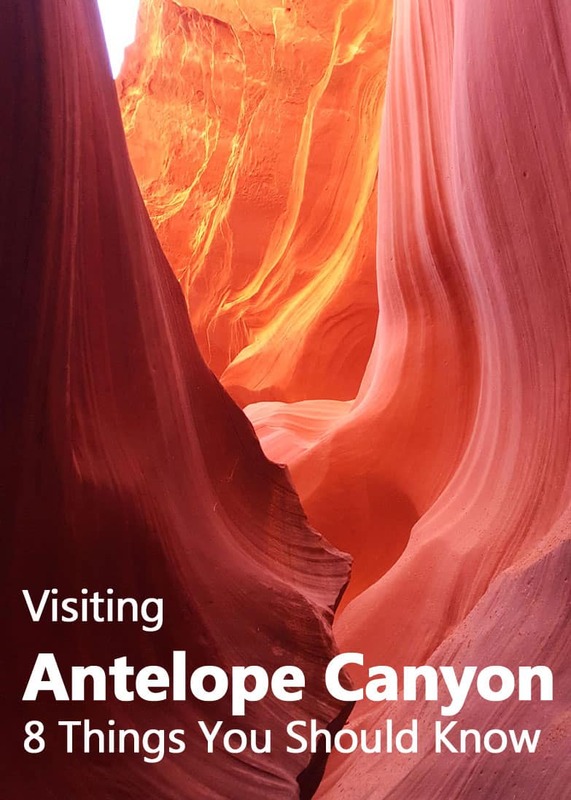 In this post I’m going to share with you some insights and tips for visiting Antelope Canyon. 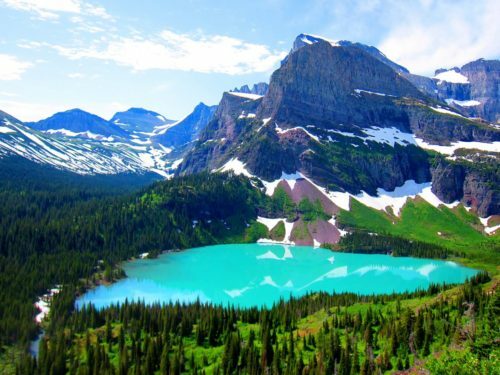 I hope these will help you make the most of your trip to this majestic place. 1. Visiting Antelope Canyon during a flash floods is dangerous. When it’s raining upstream, tours can be cancelled without prior notice. If you can, travel off-season and leave some room for flexibility. Some people think Antelope Canyon is a national park. I can actually see why. It would have certainly become a national park had it not been on Navajo land. It is one of several Navajo tribal parks, maintained by tribal authorities. Oh, and just in case you’re wondering. Antelope Canyon is not in Utah. It’s in Arizona. I know this may sound silly but people actually Google for “Antelope Canyon, Utah”, so worth mentioning. Navajo territory follows Daylight Saving Time (DST) during summer. Most areas in Arizona do not. That means it’s one hour earlier in the Navajo reservation. If you’re visiting Antelope Canyon and arriving from outside the reservation on the same day, adjust your timetable accordingly. It is the same canyon but there are two separate points where you can visit: Upper Antelope Canyon and Lower Antelope Canyon. The upper canyon is the more popular one. It’s wider and more accessible with the entry point being on ground level. The lower canyon has a narrower and steeper entry point and visitors go down several flights of stairs. The regulations of the Navajo Tribal Parks Authority state that you can only visit Antelope Canyon with a Navajo guide. Guided tours are available throughout the year for both the Upper and Lower canyons. You can choose between a general tour which lasts about an hour or a more slow-paced photography tour which can last up to two hours. Park regulations limit all visits to no more than two hours. 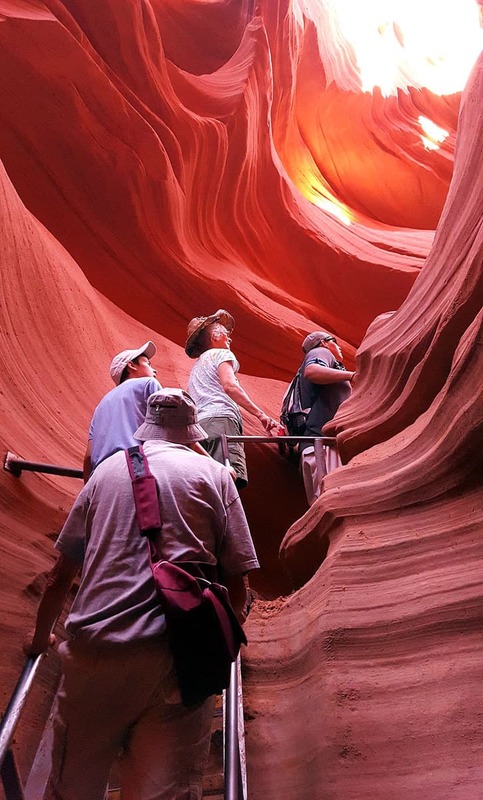 There are three official tour companies that can take you to the upper Antelope Canyon. Tour operators can usually pick you up from the town of Page, or you can drive to the parking lot, closer to the canyon’s southern entrance and be picked up there. They will then drive you on their 4WD trucks to where the tour begins. There are two companies offering guided tours to the lower part of the canyon. They are located right across from one another next to the northern entrance to the canyon. Visitors leave their cars in the parking lot and it’s a short hike from there to the entrance. Visiting Antelope Canyon is expensive. The guided tours companies charge $20-$40 per person for the tour itself and there is an additional $8 fee to be paid to the Navajo Tribal Parks. 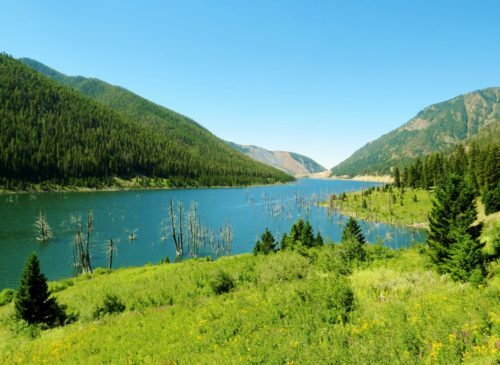 If you want to save on cash, travel to the lower canyon and start your tour there. It’s cheaper than getting one of the tours which drive you to the canyon. You’d think that these fairly exuberant fees will get you some tender loving care… but they don’t. Visiting the upper canyon, you will be thrown around in a 4WD truck across the desert. Not recommended for pregnant women, or those suffering from back pain and other health issues. Pretty uncomfortable for the rest of us too. If you drive to the lower canyon, you have to go down (and then up) five flights of stairs. This is what we’ve done and frankly, the stairs were not much of a problem. 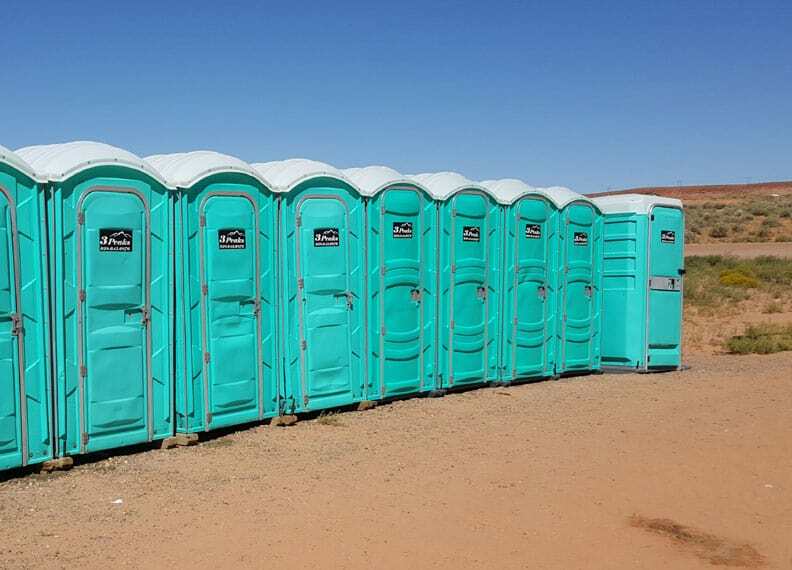 However, be prepared for an overall dismal experience before entering the canyon. You’re expected to wait for at least 45 minutes in the heat of the Arizona desert – even if you booked your tour in advance. There’s some shade but no air conditioning. The bathrooms leave a lot to be desired too… If you like yours clean and modern, make sure you find a place to go before heading out for the tour. 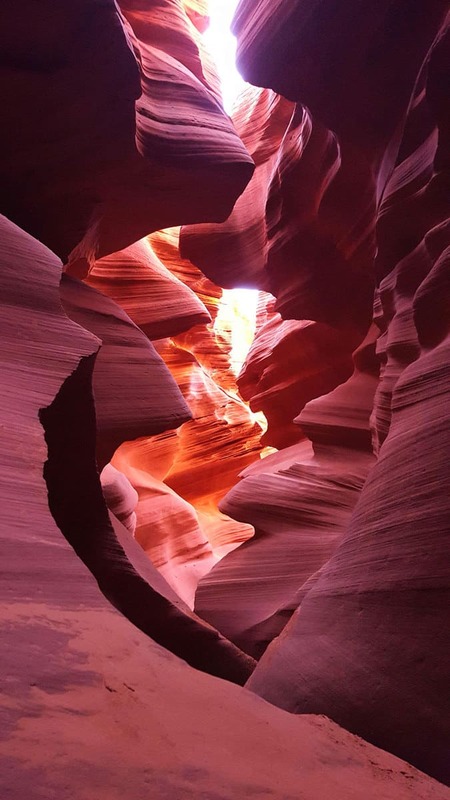 Antelope Canyon is near Page, AZ – a small town in the Navajo reservation. The town has several major attractions, including Antelope Canyon, Glen dam, Lake Powell, Rainbow Bridge and the Horseshoe Bend. With so many tourists pouring into town, accommodation tends to be expensive. Make sure you book in advance, or you’ll be left with the least desirable spots (and sometimes with none at all). “Deals Finder” by Booking.com so you can be sure you’re seeing the best deals in Page. Trust me, you’ll need ’em. 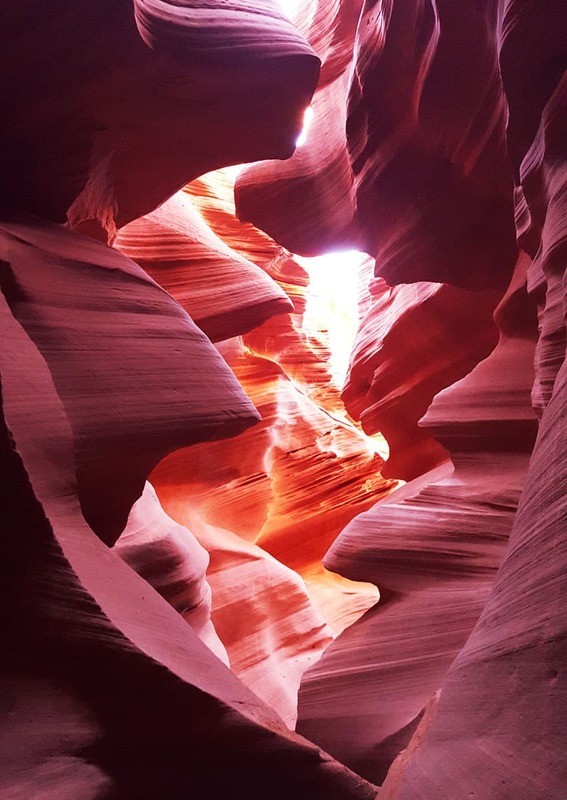 Visiting Antelope Canyon – Is it worth the hassle? 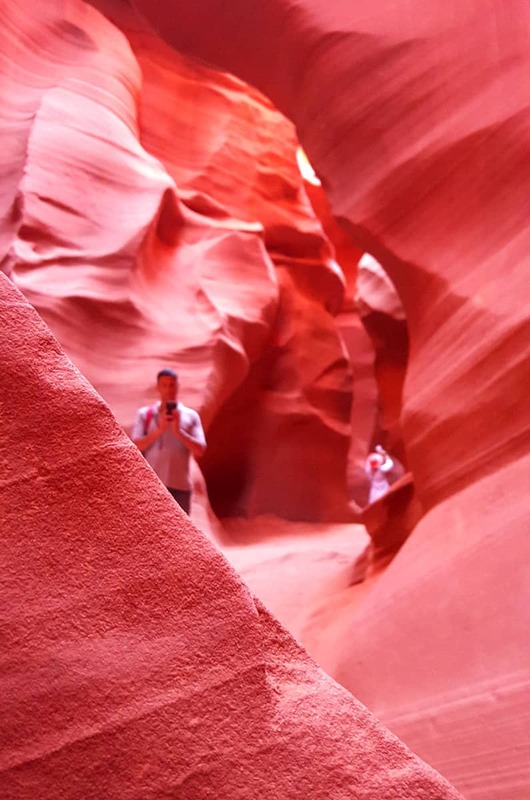 So, between the expensive tour in an expensive town and waiting for an hour in the heat of the desert with no decent bathrooms – should you even be visiting Antelope Canyon? Antelope Canyon is a bucket list item. The rock formations are amazingly beautiful and serene. Yes, the tour is crowded and can even feel a little bit rushed but you’ll be spending it feeling in total awe of the beauty of nature. 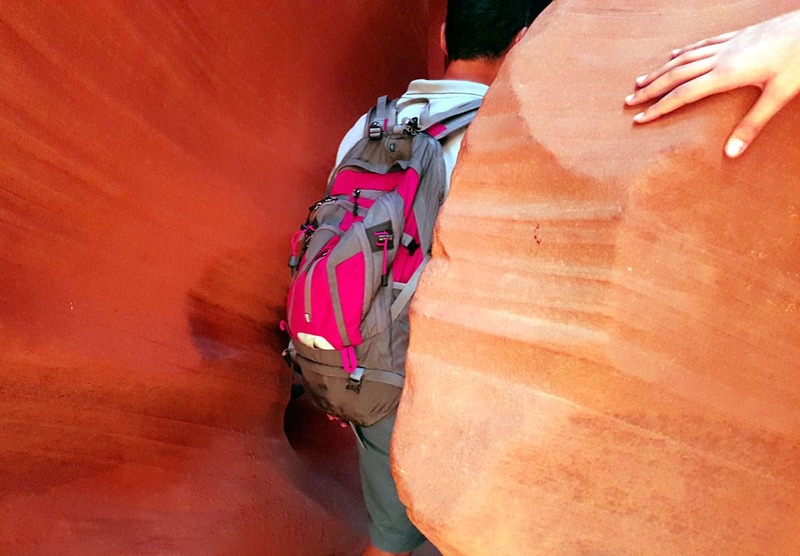 There are some narrow passages in the Lower Antelope Canyon but nothing was too uncomfortable. Even the rubble was photogenic! One of my sons hiking the canyon. I think this photo can give you a sense of how deep this slot canyon can be. Beautiful formations wherever you turn your head. I hope you find this post useful. If you do, please share it with your friends on Facebook and Twitter. And, as always, comments are welcome! Also when visiting the canyons please DO NOT forget to drink water, plenty of water! This dry heat not humid heat, you need to drink plenty of water when visiting Arizona or anywhere around Arizona. Can we tour both upper and lower in the same day? I think that if you want to do both Upper and Lower on the same day, I would make reservations in that case. Just to make sure you have everything in order. You’ll be visiting midweek and before Memorial Day so I *think* you could probably do without reservations. We were there in September after Labor Day and had no problem getting on the next tour (there were four of us). However with two tours, you may want to make sure you have them spaced with enough time in between. I’m wondering if you know anything at all about taking a tour with a 1year old? I’m reading of various tour company sites that backpacks including baby carriers are not allowed?! Nor are carseats for the drive. I see in your photos someone has on a backpack and I’ve read reviews of people taking their young children, but no one addressed the issue of needing to carry a baby or get them to the canyon safely…. any help would be appreciated! Excellent question. We carried our backpack in and no one told us anything but it was a small one. I have to say, on our tour, I didn’t get the impression that they were too concerned with anything touching the rock. As far as I know, the drive in their vehicles is a makeshift kind of operation and people don’t even wear seat belts (the ones we saw a couple of years ago weren’t). To be honest, with a baby, I would just arrive in my own vehicle. Even if this means doing the lower canyon tour which is narrower. I usually would advise people to call the operators and find out in advance via the phone. To be totally honest, my general impression of how they run things over there is that they would just let you do whatever the person in the counter or the guide feels is ok at that moment. Fortunately, I also felt like as long as you pay for the ticket, they don’t really care about much else… This isn’t like a national park with rangers and clear written rules. Here’s what you could do though – email them and try to get an answer in writing. Then print that email and bring it along with you. That’s what I would do for my own peace of mind. Good luck and I’d love to hear an update after your visit! Enjoy Antelope Canyon! Thank you so much for the information you’ve provided. My husband and I are making 2018 our year of travels. He’s taking me on our first trip of the year at the end of the month. He chose Page Az and Antelope Canyon because next week is my birthday and I’ve always wanted to go. We’ve booked our hotel and found we needed tips as to where to go/do from there. You taking the time to share your tips with the rest of us has aleveated a lot of stress. Thank you, thank you! I’m so glad you found this post helpful! I’m sure you’re going to have a fantastic time in page, especially with it being off-season and not so hot. There’s more to do in Page so if the weather is nice, why not rent a boat and go on the lake? We did that and it was one of the highlights of our trip! 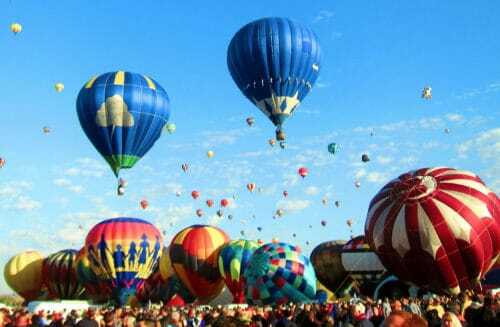 Enjoy your trip whatever you choose to do and happy birthday! Your pictures are gorgeous. I much appreciate the info. Time zone info is confusing. From what I understand, the Navajos at Antelope Canyon tours are using the same time (Standard Time) year round as Page AZ does, even though most of their nation elsewhere in AZ does use Daylight Saving Time. Time zones in that area of Arizona are very confusing indeed! I have to say, I didn’t notice a difference between the Antelope canyon tours and the rest of Page. I’m pretty sure they use local time. Might be best to give them a phone call to make sure though, just in case. Thanks for the info! Is the lower canyon a 1-way tour, meaning the entrance and the exit are 2 different places, or do you come back via the same entrance again? Thanks. Hi Nermin, Yes it was a one-way tour. We had to walk for a bit before entering in one end and then came out at another point. We never had to turn back. Thank you so much for the detailed/great information. I booked with Dixie Ellis’ Lower Antelope Canyon Tours and their fee is much more affordable. Hi Jen-Lien, I’m so glad you found the post helpful. If you can, come back and add a comment with your own tips for other users to see. I hope you have an awesome visit to Antelope Canyon! Hi Jen-lien, did you complete the tour? Did you like it? Trying to book it for December! Kiran — i just went on my tour with Dixie Ellis this past saturday 10/21 and it was absolutely breathtaking. I actually booked the kayak combo tour, so you can kayak through another portion of antelope canyon, and it was an unforgettable day. Highly recommend. Worth noting, i am not an outdoorsy person and saturday was my first time kayaking! They took great care of us!! Next PostThe City Museum in St. Louis, MO – Better than Disneyland!